GENIUS NY is funded with $5 million from NYS Empire State Development (ESD) and from contributing sponsors. 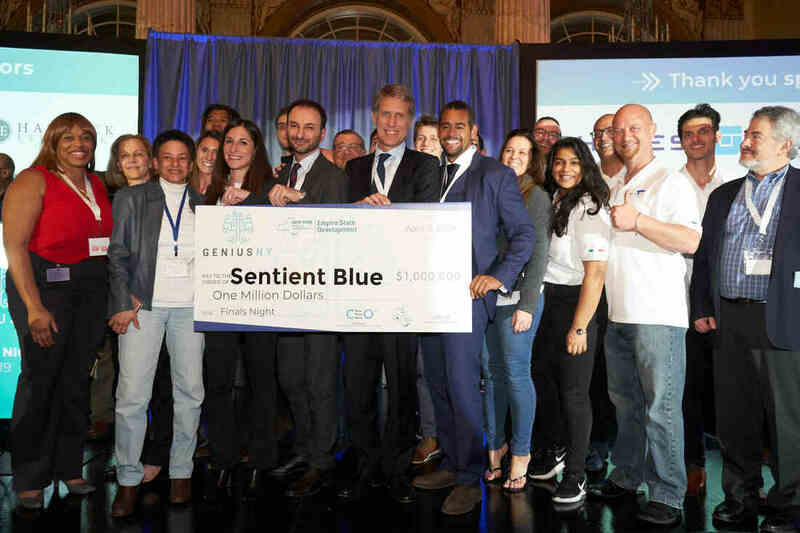 Of this, $4 million is dedicated for direct prizes and support expenses, which include subsidized rent for startups, stipends, speakers, advisors, developers, and other entrepreneur-consumed resources. These expenditures are awarded to participants at the end of the three month acceleration period and drawn out over the next 9 months. Finding and fueling investor and sponsor interest is another important element of the GENIUS NY program. Participants can expect to be exposed to such opportunities via mentoring and advisement from experts in the unmanned systems industry and from interested investors associated with The Tech Garden. With millions being invested into Central New York in the areas of unmanned systems and data-to-decision applications over the next 5 years, aligning GENIUS NY with that investment is a no-brainer. Not only will the GENIUS NY companies be collaborating with technology peers, mentors, and advisers in the accelerator, but opportunities for growth in the technologies of unmanned systems and data to decisions will be greater here than in any other part of the world. Below are our preferred categories and some suggested sub-categories (not a complete list). As most of these technologies and markets are still emerging, we welcome outside-the-box thinking and are excited for applicants to show us how their technologies match up to our categories. Major programming will revolve around a two phase in-residence accelerator. The two phases are designed to be competitive in the first phase when teams are competing for investment, but non-competitive in the second phase when collaboration and cross-pollination are needed the most. Teams will prepare their Business Case to present to the judges at the three month mark. ​​To help prepare Business Cases, teams will be exposed to speakers, instructors, and workshops (these events will be aligned to a participant's business stage). The Tech Garden also has a collection of pre-qualified and pre-negotiated service providers as a resource to either start companies or scale companies (law, insurance, accounting, marketing, developers, etc.). This phase is all about execution and getting ready for the Investor Demo Day's. Teams will be "wrapped" with selected mentors that have been selected based upon each team's Business Case. Most accelerators can find generalists for mentoring, but if you are looking for a specialized mentor for your leading edge unmanned business, this is the place to get it. ​Follow-on Incubation is offered after the Investor Demo Day with incentives of follow-on funding to continue operating in Central New York. ​The Tech Garden core staff consists of a program manager, resource manager, and events manager. In addition to the core staff, the GENIUS NY program is run by a dedicated team consisting of the Director, Instructional Design Manager, dedicated Resource Manager and Marketing and Events Manager. The whole Tech Garden, GENIUS NY, and CenterState CEO staff is dedicated to the success of the GENIUS NY teams. GENIUS N​Y is operated and administered by The Tech Garden located in a downtown office building at 235 Harrison Street, Syracuse, NY. The 52,000 square foot facilities have office space in which startup businesses work, learn, collaborate, and grow. GENIUS NY participants also have access to a theater, conference and meeting room space, and a luncheon/lounge area. Utility expenses are included in the subsidized rent, along with the provision of standard office furniture and equipment. In addition to The Tech Garden's space reserved for incubator "residents", The Tech Garden also has space reserved for accelerator programs. Our dedicated spaces are flexible to allow collaboration, team execution, and instruction.